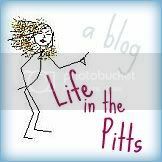 Life in the Pitts: Hey guys! Welcome back! Hope you had a great trip. knowing that makes my day better already! Welcome back! How was the trip? Are you all tanned up? woohooo!!! sooo how was it? how was it? enquiring minds need to know!! you don't know me and after stunmbling onto your blog i was really disapointed. first, your best friend should be your husband. period. second, never, ever, talk bad about your man! never! you are heading down a very sad road were you will always find yourself 'in the pitts'. take my advice or not, your choice. but if you say that he (your husband) is the man of your dreams then be the woman of his and stop this nonsense! Anyway, so glad you are back! I can't wait to heart about your trip! though you are right about a husband being a wifes best friend, you should be more informed before you criticize. Did you find out who Andrew was? Read the rest of the post or something, and you'll find that her blog is humorous. And if you knew her at all, you would not judge her in this way.